This study investigated how a socioscientific issues (SSI) based environmental science class can be structured for promoting the agency of the students. This study utilizes the definition of agency that is purposeful actions taken by a student in their own interest or the power of the individual to choose what happens next. Using a qualitative approach, this study employed a descriptive type of case study research design. 31 high school students and a science and a social studies teacher coteaching an environmental science class were the participants. The data collected in this study included classroom observations, semi-structured interviews, and informal conversations with the participant teachers and students in the classroom environment. The data analysis were done through open coding and thematic analysis respectively. The findings of this study indicated that teachers used the multifaceted and interdisciplinary nature of the socioscientific issue to empower their students to select their path based on their personal interests. As a result, the students were more motivated and encouraged to make differences in the society they lived in by using the community-based projects for improving the quality of the environment surrounding them. Ahearn, L.M. (2001). Language and Agency. Annual Review of Anthropology, 30, 109-137. Basu, S. J., & Barton, A. C. (2010). A Researcher-Student-Teacher Model for Democratic Science Pedagogy: Connections to Community, Shared Authority, and Critical Science Agency. Equity & Excellence in Education, 43(1), 72-87. Basu, S. J., Barton, A. C., Clairmont, N., & Locke, D. (2009). Developing a Framework for Critical Science Agency through Case Study in a Conceptual Physics Context. Cultural Studies of Science Education, 4(2), 345-371. Basu, S.J, Barton A.C & Tan E. (2011). Democratic Science Teaching: Building the Expertise to Empower Low-İncome Minority Youth in Science. Sense Publishers: Netherlands. Burek, K., & Zeidler, D. L. (2015). Seeing the Forest for the Trees! Conservation and Activism Through Socioscientific Issues. In EcoJustice, Citizen Science and Youth Activism (pp. 425-441). Springer International Publishing. Davies, I. (2004). Science and Citizenship Education. International Journal of Science Education, 26(14), 1751–1764. Fensham, P. (1997). School Science and Its Problems with Scientific Literacy. In R. Levinson & J. Thomas (Eds. ), Science today: Problem or crisis? (pp. 119–136). London, UK: Rutledge. Freire, P., & Macedo, D. (1987). Literacy: Reading the Word and the World. Massachusetts: Bergin & Garvey. Gilbert, A., & Yerrick, R. (2001). Same School, Separate Worlds: A Sociocultural Study of İdentity, Resistance, and Negotiation in a Rural, Lower Track Science Classroom. Journal of Research in Science Teaching, 38, 574–598. Hodson, D. (2003). Time for Action: Science Education for an Alternative Future. International Journal of Science Education, 25, 645–670. Holland, D. (1998). Identity and Agency in Cultural Worlds. Cambridge: Harvard University Press. Klosterman, M. I., & Sadler, T. D. (2010). Multi-level Assessment of Scientific Content Knowledge Gains Associated with Socioscientific Issues-based Instruction. International Journal of Science Education, 32(8), 1017-1043. Klosterman, M. L., Sadler, T. D., & Brown, J. (2012). Science Teachers’ Use of Mass Media to Address Socio-scientific and Sustainability Issues. Research in Science Education, 42(1), 51-74. Kolstø, S. D. (2001). Scientific Literacy for Citizenship: Tools for Dealing with the Science Dimension of Controversial Socioscientific Issues. Science Education, 85, 291–310. Kyle Jr, W. C. (1996). Editorial: The importance of investing in human resources. Journal of Research in Science Teaching, 33(1), 1-4. Lee, H., & Witz, K. G. (2009). Science Teachers' Inspiration for Teaching Socio-scientific Issues: Disconnection with Reform Efforts. International Journal of Science Education, 31(7), 931-960. Levinson, R. (2006). Towards a Theoretical Framework for Teaching Controversial Socio-scientific Issues. International Journal of Science Education, 28(10), 1201–1224. Levinson, R. (2008). Promoting the Role of the Personal Narrative in Teaching Controversial Socio-scientific Issues. Science & Education, 17(8), 855-871. Malinowski, B. (1961). Argonauts of the Western Pacific. New York: E. P. Dutton. Marshall, C., & Rossman, G. (1995). Designing Qualitative Research (2nd ed.). Thousand Oaks, CA: Sage. Martin, J. (2004). Self-Regulated Learning, Social Cognitive Theory, and Agency. Educational Psychologist, 39, 135-145. McNeill, K. L., & Vaughn, M. H. (2012). Urban High School Students’ Critical Science Agency: Conceptual Understandings and Environmental Actions around Climate Change. Research in Science Education, 42(2), 373-399. O’Neill, T., & Barton, A. C. (2005). Uncovering Student Ownership in Science Learning: The Making of a Student Created Mini-Documentary. Journal of School Science and Mathematics 105(6), 292–301. Osborne, J., MacPherson, A., Patterson, A. & Szu, E. (2012). Introduction. In M. Khine (Ed. ), Perspectives On Scientific Argumentation: Theory, Practice and Research (pp. 3–15). Dordrecht, The Netherlands: Springer. Podolefsky, N. S., Rehn, D., & Perkins, K. K. (2013). Affordances of Play for Student Agency and Student-Centered Pedagogy. American Institute of Physics Conference Series, 1513, 306-309. Pruyn M. (1999). Discourse Wars in Gotham- West: A Latino Immigrant Urban Tale of Resistance and Agency. Boulder, CO: Westview. Ratcliffe, M., & Grace, M. (2003). Science Education for Citizenship. Maidenhead: Open University Press. Ravetz, J (2002). Memorandum submitted by Dr. Jerry Ravetz, Ev. 109, Appendices to the minutes of evidence taken before the House of Commons Science and Technology Committee, Science Education from 14 to 19, Third Report of Session 2001–02. London, UK: The Stationery Office Ltd.
Sadler, T. D. (2004). Informal Reasoning Regarding Socioscientific Issues: A Critical Review of Research. Journal of Research in Science Teaching, 41, 513–536. Sadler, T. D. (2009). Situated Learning İn Science Education: Socioscientific İssues as Contexts for Practice. Studies in Science Education, 45, 1-42. Sadler, T. D., Barab, S. A., & Scott, B. (2007). What Do Students Gain by Engaging in Socioscientific Inquiry?. Research in Science Education, 37(4), 371-391. Sadler, T.D., Chambers, F.W., & Zeidler, D.L. (2004). Student Conceptualisations of the Nature of Science in Response to a Socioscientific Issue. International Journal of Science Education, 26, 387–409. Schalk, K. (2009). A Case-Study Of A Socio-Scientific Issues Curricular And Pedagogical Intervention In An Undergraduate Microbiology Course: A Focus On Informal Reasoning. Unpublished Doctoral Dissertation, University of Maryland, MD. Yager, R. (1992). Viewpoint: What We Did Not Learn from the 60s about Science Curriculum Reform. Journal of Research in Science Teaching, 29, 905–910. Yin, R. (2003). Case Study Research: Design and Methods (3rd ed.). Thousand Oak, CA: Sage. Zeidler, D. L. (Ed.). (2003). 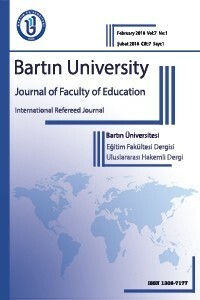 The Role of Moral Reasoning on Socioscientific İssues and Discourse in Science Education. Dordrecht: Kluwer Academic Publishers. Zeidler, D. L., Sadler, T. D., Simmons, M. L., & Howes, E. V. (2005). Beyond STS: A Research-based Framework for Socioscientific Issues Education. Science Education, 89(3), 357-377. Zeidler, D. L., Sadler, T. D., Applebaum, S., & Callahan, B. E. (2009). Advancing Reflective Judgment through Socioscientific Issues. Journal of Research in Science Teaching, 46(1), 74-101. Zohar, A., & Nemet, F. (2002). Fostering Students’ Knowledge and Argumentation Skills through Dilemmas in Human Genetics. Journal of Research in Science Teaching, 39, 35–62.